We recommend checking out our discussion threads on the Pacsafe Strapsafe 100 TSA-Accepted Luggage Strap 10460402, which address similar problems with connecting and setting up Bag Straps Pacsafe. The user manual for the Pacsafe Strapsafe 100 TSA-Accepted Luggage Strap 10460402 provides necessary instructions for the proper use of the product Photography - Bags & Cases - Bag Straps. The Strapsafe 100 TSA-Accepted Luggage Strap from Pacsafe is designed to provide enhanced security for a bag or piece of luggage in airport terminals, bus terminals, or other crowded locations where you may have to momentarily divert your attention from your belongings. It is comprised of a polypropylene webbing with an integrated, multiple-dial combination lock. Together, the webbing and lock mechanism can be used to wrap around and constrict a bag or piece of luggage. Movement of zippers is then impeded, blocking access to compartments or pockets, which deters theft. When subject to the security process at an airport, it may be necessary for security agents to inspect the contents of a bag or luggage. To access the contents of a wrapped bag or luggage, security agents are permitted to cut or break a lock unless they are able to otherwise open it. To prevent your security from being compromised outside of a required inspection, the Strapsafe 100 TSA-Accepted Luggage Strap has the ability to be opened and relocked by a legitimate Transport Security Administration (TSA), Her Majesty's Revenue and Customs (HMRC), or Canadian Air Transportation Security Authority (CATSA) officer's master key. If that occurs, an indicator button on the lock turns from green to red. The indicator button can be reset by entering the combination and opening the lock's latch. This provides access to the indicator button's reset switch and allows the user to tighten the webbing or allow for slack. The combination for the integrated lock can be set and changed by its owner, while the webbing can be wrapped around a circumference ranging from 43.0 to 74.8". 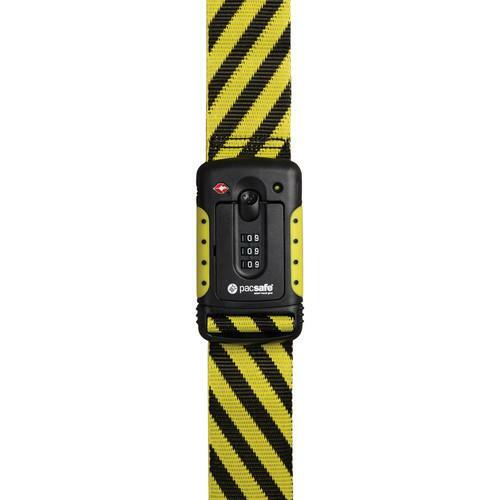 When retrieving a bag or luggage from a baggage claim, this strap's black and yellow striped webbing can help you more easily identify your belongings, saving time while in transit. If you own a Pacsafe bag straps and have a user manual in electronic form, you can upload it to this website using the link on the right side of the screen. Box Dimensions (LxWxH) 8.6 x 4.6 x 2.1"
The user manual for the Pacsafe Strapsafe 100 TSA-Accepted Luggage Strap 10460402 can be downloaded in .pdf format if it did not come with your new bag straps, although the seller is required to supply one. It is also quite common that customers throw out the user manual with the box, or put the CD away somewhere and then can’t find it. That’s why we and other Pacsafe users keep a unique electronic library for Pacsafe bag strapss, where you can use our link to download the user manual for the Pacsafe Strapsafe 100 TSA-Accepted Luggage Strap 10460402. The user manual lists all of the functions of the Pacsafe Strapsafe 100 TSA-Accepted Luggage Strap 10460402, all the basic and advanced features and tells you how to use the bag straps. The manual also provides troubleshooting for common problems. Even greater detail is provided by the service manual, which is not typically shipped with the product, but which can often be downloaded from Pacsafe service. If you want to help expand our database, you can upload a link to this website to download a user manual or service manual, ideally in .pdf format. These pages are created by you – users of the Pacsafe Strapsafe 100 TSA-Accepted Luggage Strap 10460402. User manuals are also available on the Pacsafe website under Photography - Bags & Cases - Bag Straps. we have our strapsafe 100 but the combination is not working. How can we reset the combination please?